When a tooth is missing, remaining teeth can shift and lead to problematic changes in your bite. Dental implant supported restorations offer many benefits that their unsupported counterparts do not. Permanence – dental implants fuse to the jawbone in a process called osseointegration. The implant posts are as permanent as your natural teeth roots. Durability – dental implant-supported restorations are secured into the jaw bone for maximum bite force that lasts a lifetime with proper care. Jawbone health – without teeth roots, the jawbone with shrink through a process called bone resorption. Dental implants act as surrogate tooth roots that protect the integrity of the jawbone. 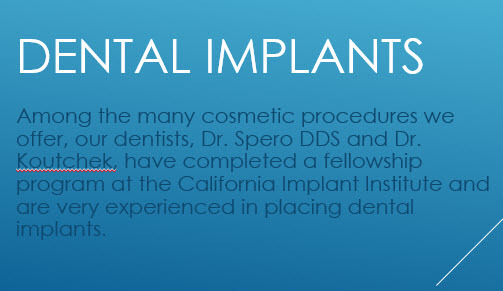 The full dental implant process takes approximately six months. After your initial consultation, the next appointment involves the placement of the titanium post into your jawbone. This post is used to secure your implant firmly onto your jaw. The process is no more painful than having a filling done, however it will take approximately five or six months to completely integrate and heal. The next phase involves placing an abutment onto the screw. The abutment will act as a base for the for your prosthetic tooth, also called a porcelain crown. Once the abutment is in place, and your prosthetic has been properly prepared, our dentist will correctly place it and make sure it feels comfortable. If you take care of your implant with proper brushing and flossing, it can last a lifetime. What Can Dental Implants Support? Dental implants are an excellent method to enhance many restorative treatments. Dental implants can support single crowns, bridges, and even a full set of dentures. Dr. Spero will develop a plan that will meet your goals and restore your smile, using methods that respect your budget. Implant dentistry is an essential field of dentistry that helps patients who’ve lost their teeth regain their quality of life. If you have more questions about this service or any of our other tooth-replacement options, please feel free to browse our site. When you’re ready to begin planning your beautiful smile, contact our Pasadena dentists serving the greater area of Pasadena, Sierra Madre, Arcadia and Monrovia. We look forward to working with you!